The vessel INSV Tarini is scheduled to return to Goa in April 2018, on completion of the voyage. 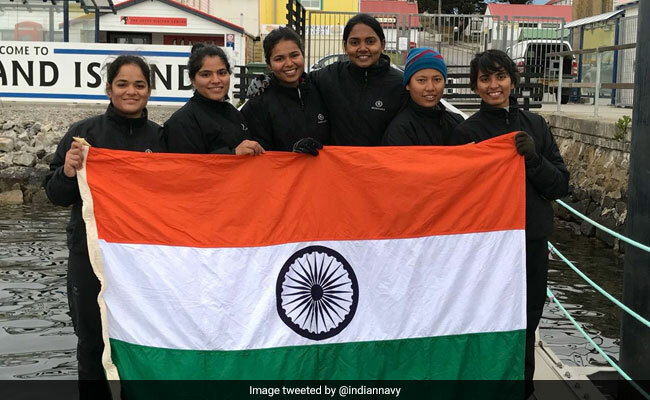 Port Stanley, Falkland Islands: The Indian Navy's sailing boat INSV Tarini, with an all-women crew, on Monday entered Port Stanley in the Falkland Islands, after crossing the Cape of Horn on January 18. The boat is on its maiden voyage to circumnavigate the world. It is likely to depart Port Stanley on February 4. The vessel and the crew experienced rough weather and stormy winds during the passage across the Pacific ocean that spanned 41 days, an official statement said. This coupled with the extremely cold climatic conditions prevailing in the region, proved to be a daunting task for the Indian Navy crew. Winds in excess of 60 knots and waves upto 7 meters were experienced on this leg. The indigenously-built INSV Tarini is a 56-foot sailing vessel, which was inducted in the Indian Navy earlier this year, and showcases the 'Make in India' initiative. "The expedition titled 'Navika Sagar Parikrama', is in consonance with the national policy to empower women to attain their full potential. It also aims to showcase 'Nari Shakti' on the world platform and help revolutionise societal attitudes and mindset towards women in India by raising visibility of their participation in challenging environs," the statement said. The vessel is scheduled to return to Goa in April 2018, on completion of the voyage. Presently, the vessel has covered three of the five legs of the voyage, with the first port halt at Fremantle (Australia) in October and the second at Lyttelton (New Zealand) in November last year. The crew has also been collating and updating meteorological, ocean and wave data on a regular basis for accurate weather forecast by India Meteorological Department (IMD), as also monitoring marine pollution on the high seas. They would interact extensively with the local populace, especially children, during the port halts to promote Ocean sailing and the spirit of adventure. The vessel is skippered by Lieutenant Commander Vartika Joshi, and the crew comprises Lieutenant Commanders Pratibha Jamwal, P. Swathi, and Lieutenants S. Vijaya Devi, B. Aishwarya and Payal Gupta. INSV Tarini was flagged off from Goa on September 10, 2017, and has covered approximately 15,000 Nautical miles, crossing the Equator on September 25 last year, Cape Leeuwin on November 9, 2017 and Cape Horn on January 18, 2018.